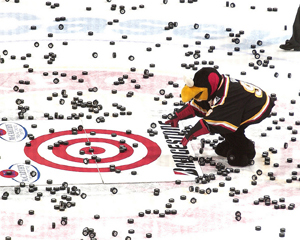 The McCarthy Tire Toss is held at 10 select home games each season. Fans are able to purchase foam tires on the concourse at those games, which are then tossed onto the ice during the second intermission. If a tire lands fully inside the bullseye of the target on the ice, the owner of that tire takes home a cash prize. If there is no grand prize winner, the tire which lands closest to the bullseye receives a gift certificate from McCarthy Tire.